Together we can make your search process efficient, effective, and even enjoyable. Our sole focus is supporting nonprofit organizations’ searches for executive directors, program managers, fundraisers and other key positions. We provide you with resources and support to maximize your time and effort, freeing you up to focus on your mission. We are a consulting firm that represents the hiring organization, not the jobseekers. We are flexible and tailor our work to meet your needs, and will be involved to the degree you prefer, from simply establishing the framework for you to implement, to partnering with you every step of the process until you hire. 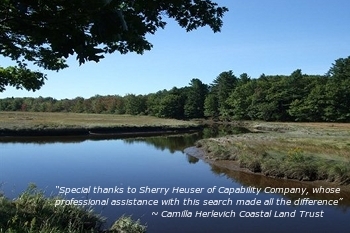 Capability Company was founded in 2001 to assist organizations with leadership transitions. Sherry Heuser transitioned from a career working in nonprofit organizations to begin with Capability Company in 2005 and became President of the company in 2009. Sherry is passionate about supporting nonprofit organizations and understands the positive impact of a strong infrastructure.